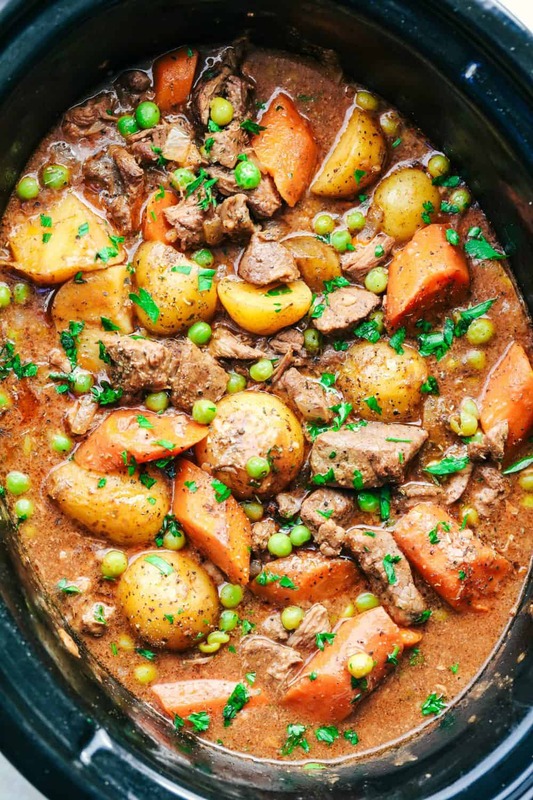 Best Ever Slow Cooker Beef Stew is the absolute perfect comforting beef stew. A thick and rich sauce filled with hearty and chunky potatoes, carrots, onions, and peas with the most amazing tender melt in your mouth beef! There is nothing better to warm you up than a hearty bowl of beef stew. I absolutely love a delicious beef stew when the cold weather starts to hit. This Slow Cooker Beef Bourguignon is a reader favorite on the blog. I have to say that it is one of my all time favorite beef stews. But I knew that I wanted to make a more classic beef stew for the blog. This beef stew is filled with a thick and rich tomato base sauce and chunky vegetables are inside. My favorite way to make a stew is in the slow cooker. I swear nothing can get that beef and veggies more tender than something that is slow cooked all day. Not only is it perfectly cooked but it fills your house with the smell of a delicious dinner that is going to make its debut. 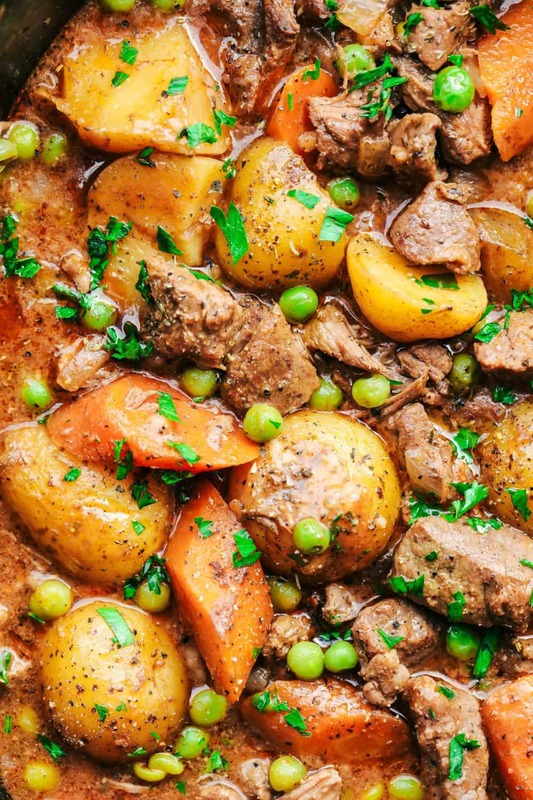 How do you make the best beef stew? Start by pan searing the beef before it goes in. This helps to seal the flavor into the beef while it cooks. Cut your veggies nice and hearty and throw it all into the slow cooker with the beef broth, tomato paste and seasonings. Let the beef and veggies cook on low for a good 8-10 hours. This ensures the beef and the vegetables to be nice and tender. The beef just melts in your mouth. About an hour before serving the stew, you whisk flour with the stew broth. This will help the sauce to thicken up and be nice and hearty and rich. All of my requirements for the best beef stew are right in this meal. A thick and rich sauce, big chunky tender hearty veggies, and melt in your mouth beef. This stew has awesome flavor. 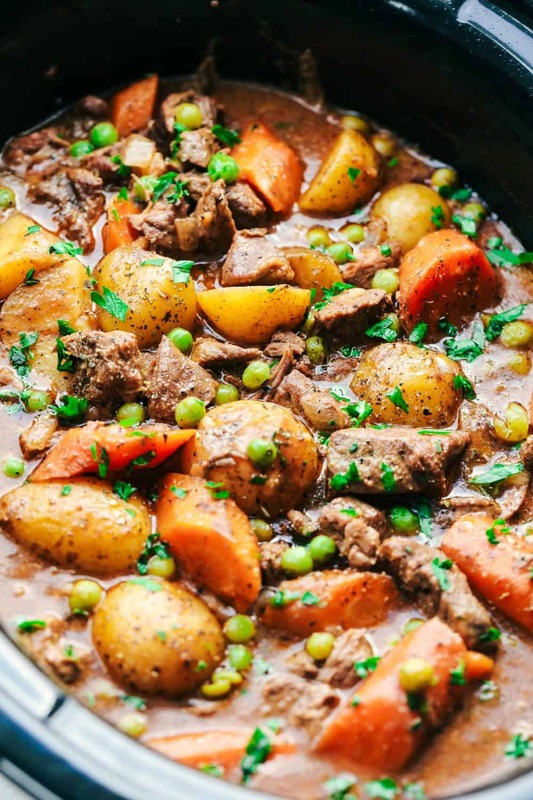 We loved everything about this stew and I know that you are going to agree that this is the best! This makes the perfect comforting and cozy meal for the chilly weather! Salt and pepper the beef and add to the skillet and sear on each side for 2-3 minutes. Transfer beef to the slow cooker. Add carrots, potatoes, onion, and garlic. Add the beef broth, tomato sauce, worcestershire, italian seasoning, and salt and pepper. Cook on low for 8-10 hours and high for 6-8 until beef and veggies are tender. An hour before serving, take out 1 cup of the beef stew and whisk with ¼ cup flour. Stir into the stew along with the frozen peas. Let the stew thicken and then serve with fresh chopped parsley on top. I don’t have a slow cooker. Can this be made in a pressure cooker or an oven? My great grandma always made hers in the oven. 9×13 covered pan, 250 degr for 6-8 hours until meat is tender. Hey there! Whenever I try to print from my iPad, it loads and then disappears. Any tips?! Have you tried to use the copy and then print from the clipboard. I use this method all the time. Works for me. Thank you SO much! I really appreciate it! You will love this stew and the bacon ranch potatoes! You can have them both together:)!! So about what size crock pot do you need for this recipe? I have a 4 quart. Should I just cut the recipe in half? Looks delicious. Will be trying this soon, and very simple as well. This stew went together easy, looked amazing but for me it was not the “comfort, best ever stew” it doesn’t taste like any stew I’ve ever had….I think it was the Italian seasoning that I didn’t like in it. The meat was very tender!! Today is the second time I have made this stew! I followed the recipe to the letter and my husband loved it. Today I am adding biscuits for the last 45 minutes as that is how his mother used to make it. Fingers crossed they turn out just as good as the stew! Thank you so much for sharing! I had a question about the recipe. It reads “Cook on low for 8-10 hours AND high for 6-8 until beef and veggies are tender.” Is that a total of 14-18 hours? Or do you cook for 8-10 hours on low OR 6-8 hours on high? Looking forward to trying this recipe over the weekend. Thank you! Kemi, I wondered the same, but she posted the total cook time as 8 hours and 15 minutes, so likely she meant “or” on high for 6-8. Didn’t see a reply to you, so I thought i’d write. Is it tomato paste or tomato sauce in this recipe? I’m with a previous comment that it has paste in one place and sauce in another. I just bought a slowcooker and your recipe is the first I want to try ? What do you mean by tomato sauce? Ketchup or something else? Like tomato paste? Great recipe. 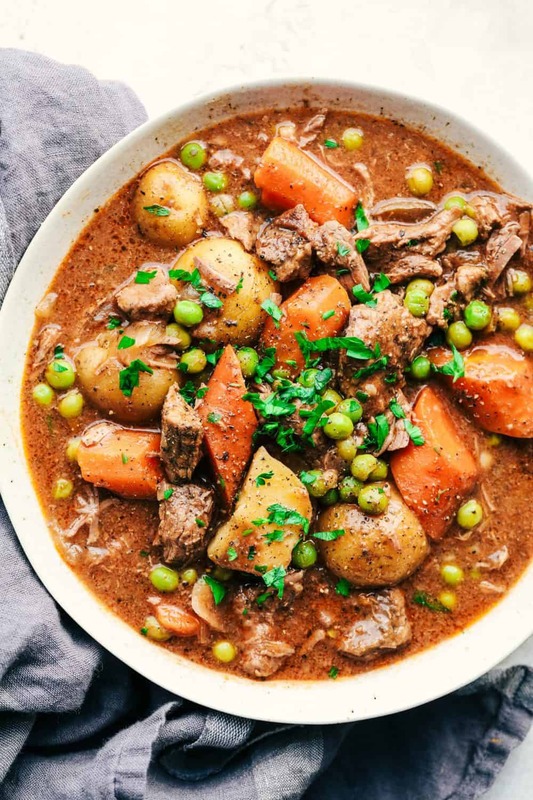 Have tried 3 or 4 different beef stew recipes. My search is over. This recipe hits all th check boxes.Perfect. Followed it exactly except for adding a few parsnips. I don’t have a slow cooker. Could I bake it? What temperature and for how long? I guess I’m an old-fashioned guy, cause I’ve always cooked stew in a stew pot. But I gave this a try, and Alyssa, it’s great. Although instead of diced, or tomato paste, i used 2 cans of stewed tomato. Again, cheers for the great dish! Delicious! I subbed 2 envelopes (1.2 oz each) of classic beef gravy mix for the flour during the last hour. Also subbed about 1/3 cup red wine for about that amount of broth at the beginning. This was delicious. Thanks for the recipe. How do I adapt this for Instant Pot? You can find tomato sauce in a can at your local grocer. It is typically near tomato chunks or diced tomatoes. Thanks for following along.